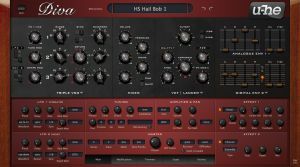 Diva is a virtual synthesizer plugin. This software synthesizer is designed to provide genuine analogue synth sounds by utilize your PC's CPU power. This CPU-hit is a necessary trade off for genuine sounding synth tones. Diva applies methods from industrial circuit simulators (e.g. PSpice) in realtime to reproduce realistic tones. The oscillators, envelopes and filters closely model components found in popular classic synths. You can mix and match your modules to create your own hybrid sound. Bugfix for silent voices while changing cutoff. New installers with improved support for new OS - Windows 7/8 and OS X Mountain Lion.